These time saving mom hacks will help to simplify your daily routines and get your family in a rhythm that works well for everyone. Thank you to Cascade pure essentials for sponsoring this post. If you’re anything like me, you spend a LOT of the day in the kitchen. When I find a new idea that helps to simplify one of my jobs in the kitchen, I get so excited! 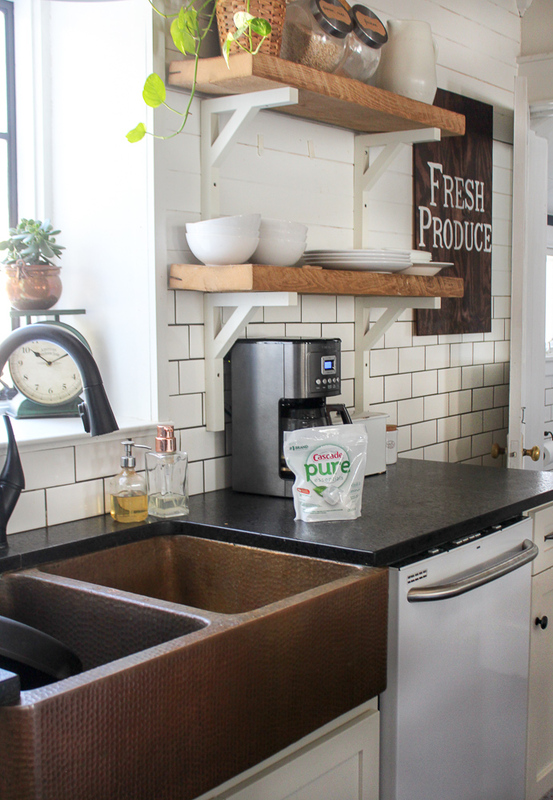 Today I’m sharing some of my BEST time saving kitchen hacks, but there’s also a list at the bottom of time saving ideas from YOU! I asked my Instagram community and you guys delivered. Don’t miss those great ideas! See these ideas in action in this video – keep scrolling to read even more time saving kitchen hacks! We did this when we moved into our house a few years ago and LOVE how it’s helped to foster independence in our kids. 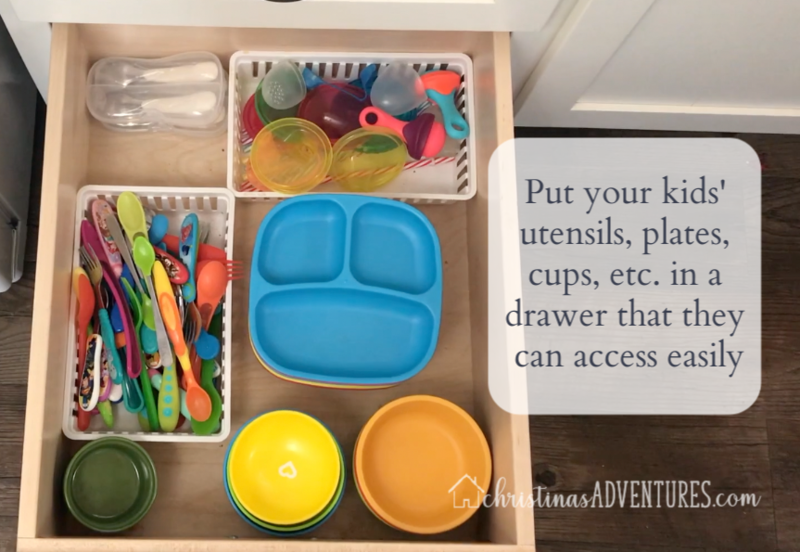 We have them empty things their items from the dishwasher that go in this drawer, and they also are in charge of helping us set the table every day. This one seems so simple, but it’s incredibly helpful for prepping for a healthy week! 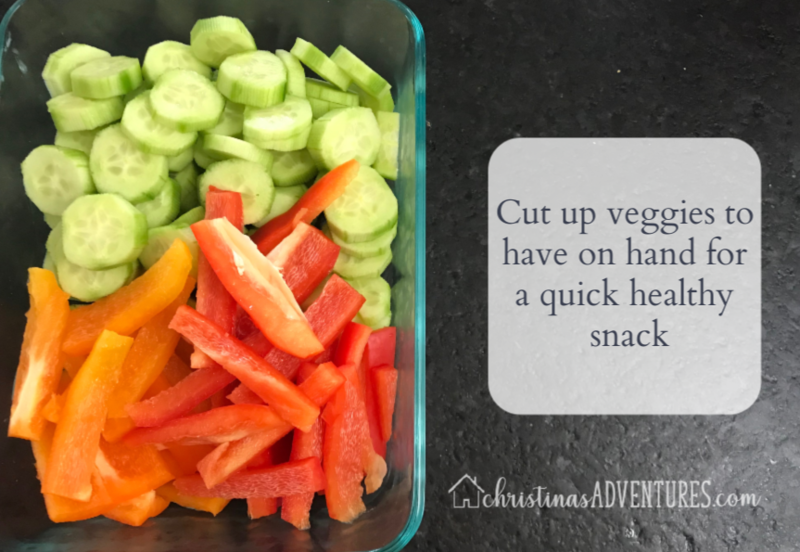 We love cutting up fresh vegetables at least twice a week. When you’re hungry – reach for that container first, before you head to the pantry. This is also our go-to when our kids are just sooooo hungryyyy before dinner. I put out that container on the counter when I am making dinner and offer it to the kids before dinner. If they ruin their dinner appetite with vegetables, I’m not complaining! Another simple change that makes life a little bit easier! 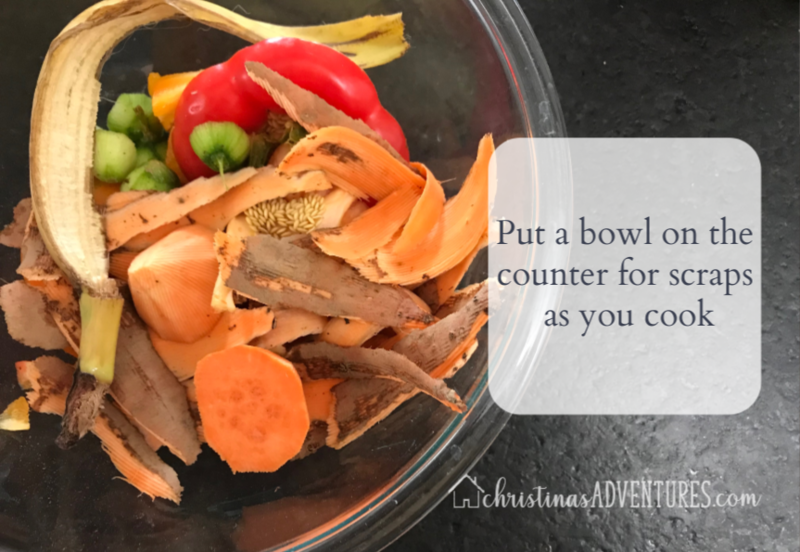 I put a bowl on the counter and throw scraps in while I’m cooking or prepping food. I then just dump out the scraps into the garbage (or compost) when I’m finished. It really helps to contain the mess of cooking and limit the amount of times you’re making trips back and forth to the garbage can. If your house is anything like mine, it can be a little chaotic in the morning. Sometimes I leave the house without having a true breakfast, but I don’t like doing that! This tip has really helped me to save time but also have a healthier start to my day. 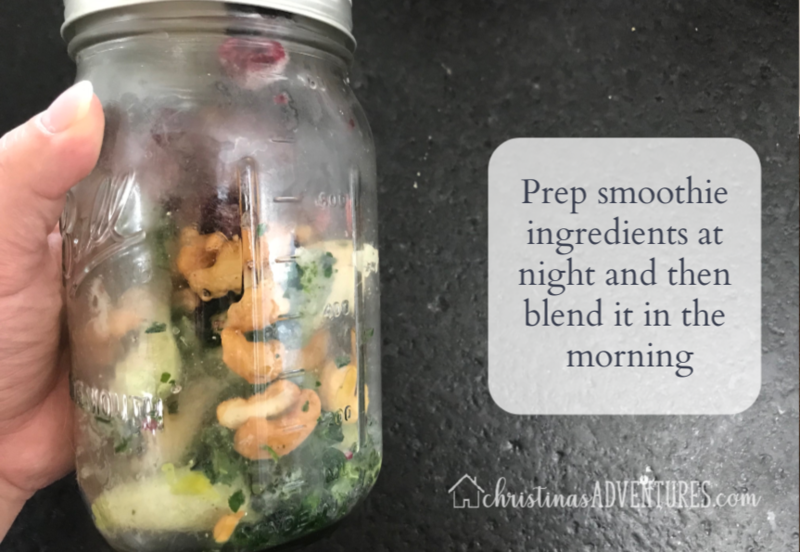 Prepare smoothie ingredients at night, and put them in a freezer safe jar. Just put the wet ingredients in the blender in the morning! One of my FAVORITE kitchen hacks ever – cook some chicken with a little bit of water, salt and pepper. Once its fully cooked, just shred it with a hand mixer. 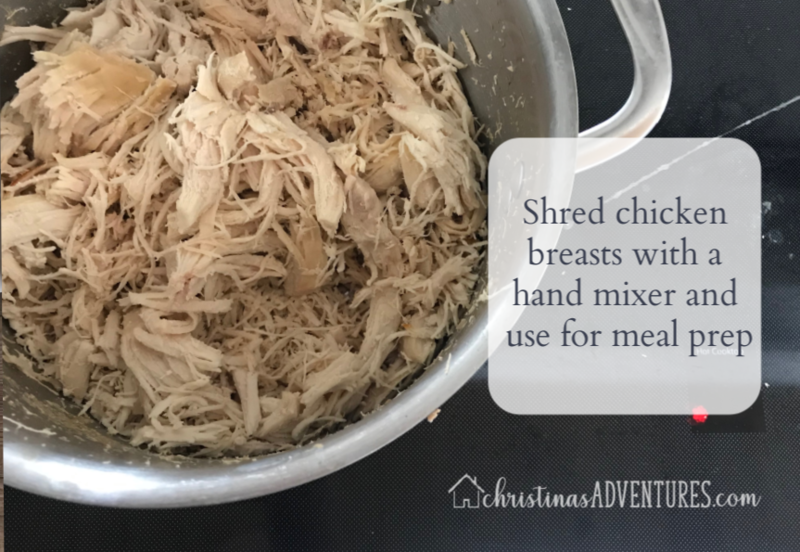 I love to do this when I get a good sale on chicken at the store, and then I shred it and put it in the freezer to use in meals later. Obviously after all of that work in the kitchen, you don’t want to spend all of that time at the sink hand washing dishes. 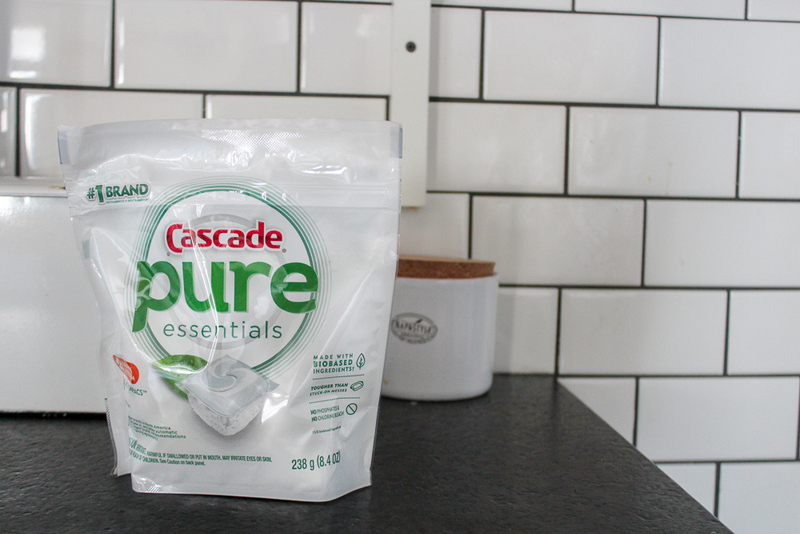 I recently fell in love with Cascade pure essentials Action Pacs – I love how they clean my dishes so well, but I also feel good about the ingredients. These action pacs have no phosphates, no chlorine bleach, they’re dye-free and infused with essential oils. 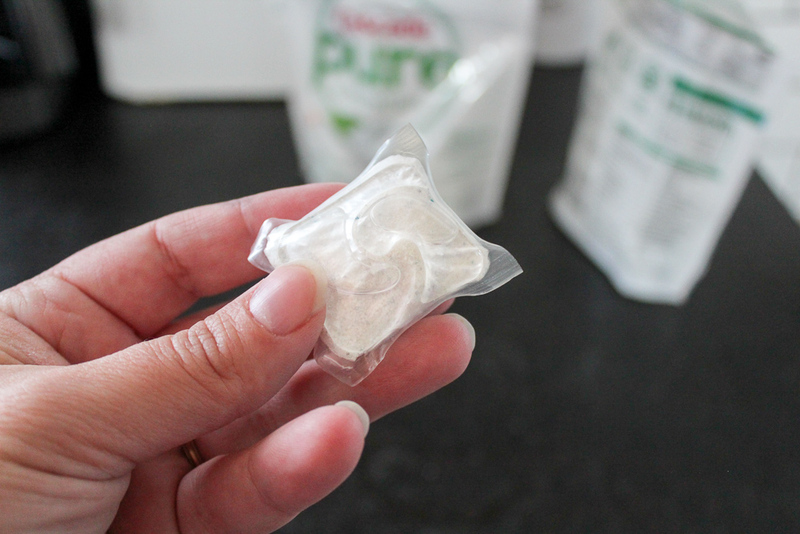 I’ve always used Cascade’s dishwasher soaps before, and now I’m happy to have these action pacs! With ⅓ bio-based and other thoughtfully selected ingredients, Cascade pure essentials takes on our hardest stuck-on messes. Pour a cup of milk in the fridge and leave cereal out overnight – the kids can help themselves to breakfast in the morning! Rely heavily on your crock pot! WOW! So many good ideas! Thank you for submitting yours – if you have another idea, please leave it in the comments! Thanks again to Cascade for sponsoring this conversation and making a product we can feel good about using in our kitchen! Were these kitchen hacks helpful for you? Please share this post on Pinterest with others!